What Does a World-Class City Look Like? Los Angeles is famous for its insecurity. For decades, we measured ourselves by how we competed against our nation’s most populous metropolis, New York, which has long prided itself on being one of the world’s greatest cities. Did we have the wealth, grandeur, and ambition to be a global city? Were our museums filled with enough important art? Did we need a ballet company? Could we be in the big leagues if we didn’t even have our own NFL team? Today, scorecards and rankings abound for the world’s cities on metrics such as green space, job creation, and “quality of life.” And city leaders are busy reshaping Los Angeles into a place where people are invested in their neighborhoods, ride a bus or bike to work, participate in a “creative economy,” and spend their leisure time in public spaces like a restored L.A. River. Are we focusing on the right things if we want to play on the world stage? We asked a few L.A. observers: Is L.A. a world-class city, and if not, will we ever get there? Los Angeles is world-class in at least one respect: the awesome size and density of its permanent homeless encampment on the bacteria-encrusted streets just east of downtown. Conditions there match the visible suffering in refugee camps at the edges of war zones, with tarpaulin shelters, open sores, and commonplace disease and death. The 54-block area known as Skid Row is the nation’s most populous cluster of homeless people. The reasons for its grandiose scale, as well as its very existence, have everything to do with the unique culture of Los Angeles. At the heart of Skid Row is the site of the old Southern Pacific Arcade Depot, at Fourth and Alameda, which brought more migrants to California than covered wagons ever did. They poured into Los Angeles looking for citrus groves, healthful air, real estate, and oil. The lower-middle-class working man was chief among the newcomers and, in that neighborhood, he could find cheap hotels, bars, hookers, and most any other kind of vice. The neighborhood grew even sketchier until 1975, when the city agreed to concentrate social services in one place and go easy on the vagrancy laws. This was a ghetto created by fiat. Mild weather, institutional neglect, and good intentions gone awry have all come together to create a squalid vista of staggering proportions, unmatched by any other American city. Even San Francisco’s Tenderloin is like a dollhouse in comparison. Fixing it is another L.A. problem—overlapping jurisdictions create confusion, and since the Row is set apart from any major thoroughfares, you really have to take deliberate action to even see it. Looking the other way has been the policy of the L.A. City Council for generations. But it still burns in the municipal consciousness like a sore that won’t heal: our world-class status as home to the most desperate kind of poverty this nation can stand. Tom Zoellner is an associate professor of English at Chapman University and the author of five nonfiction books. Los Angeles already is a world-class city. For decades, it has been energized by the economic vigor of Hollywood and, more recently, by Silicon Beach. It has become a place where art—on a very high level—is both consumed and produced. Buildings such as Disney Hall and the Broad museum have made the city an architectural destination. Ever since the “Helter Skelter” show at MOCA in 1992, Los Angeles museums have cultivated and shown its artists in their own backyard. This is in direct contrast to New York City, once the unchallenged hub of North American culture, which thanks to 20 years of rapacious gentrification, has devolved into little more than a theme park for rich people. Yes, culture is still consumed in Manhattan. Upscale galleries abound. Broadway, with its daunting ticket prices, remains the benchmark for live theater. But increasingly, the art in these galleries and theaters is imported from outside Manhattan. Artists can no longer afford to live there. In fairness, some artists still seek out small lives in New York’s outer boroughs. But many Manhattan residents seem to be so drunk on Wall Street money and overvalued real estate that they have lost sight of the city’s former status as a cultural beacon—the magnetic pull that enabled run-down real estate to be overvalued in the first place. Los Angeles will continue to evolve as a world-class city because sometime during the last 40 years, it discovered the value of its history. L.A.’s established and emerging artists are part of that value; they need to be protected as assets. Developers such as Andrew Meieran, who resurrected Clifton’s Cafeteria, are stewards of that history. Not all development is malignant. 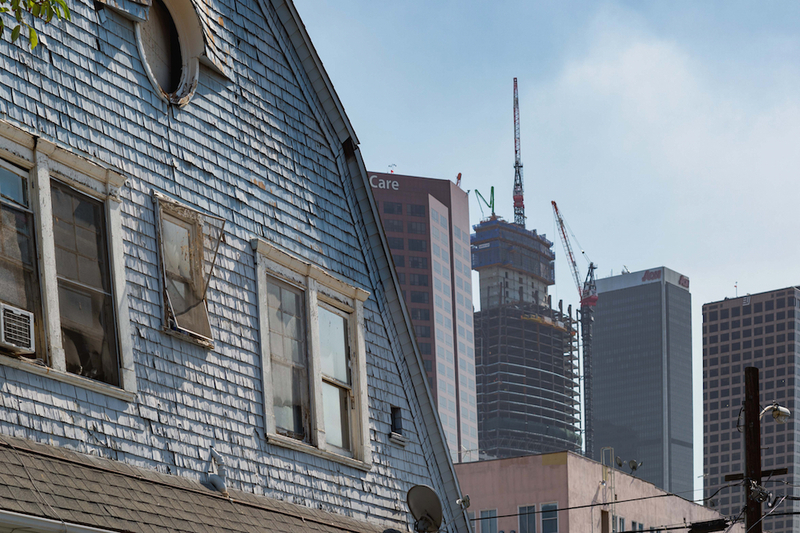 The trick is for L.A. to grow without losing its character. M.G. Lord is an author whose most recent book is The Accidental Feminist: How Elizabeth Taylor Raised Our Consciousness and We Were Too Distracted By Her Beauty to Notice. She teaches at USC. I love L.A. But on the question of whether my beloved L.A. will ever be truly a world-class city, I’m doubtful. A lot of that skepticism relates to history, or lack thereof. L.A. just hasn’t experienced nearly as much history as the greatest cities of the world. And that may not be such a bad thing. Unlike Rome, London, Beijing, or Paris, L.A.’s never been an empire that dispatched armies and navies to conquer distant lands, subjugate their people, and exploit their wealth. Thankfully, L.A.’s imperial ambitions have been far less bloody and much closer to home, like annexing San Pedro to build a port, or planting the DWP’s flag in the Owens Valley to get a steady supply of water. Through Hollywood, L.A. has colonized global pop culture, but we’ve never really thought we should run the world. The cities we identify as world-class have also earned that distinction because of how they’ve suffered through history. Yes, Los Angeles has had its earthquakes, floods and riots, but all in all, L.A.’s had remarkably good luck during its more than 200 years of civic history. We’ve never experienced invasion, bombardment, or foreign occupation. We’ve never been the center stage for political bloody revolution. We’ve never seen our population decimated in a great plague, or the city turned to ash in a great fire. And we’ve never experienced an out-of-the-blue style attack like 9/11 that left thousands dead. If aggression or a certain amount of historical tragedy is the price of admission to being considered one of the world’s great cities, I can only hope Los Angeles stays out of the club. Saul Gonzalez is a producer and reporter for public radio station KCRW and a contributing correspondent for PBS. He was formerly a producer and reporter for KCET and the Los Angeles producer for public television's NewsHour with Jim Lehrer. Anyone who travels outside the U.S. knows that L.A. is in the big leagues in the minds of those abroad. It is time for L.A. residents to awaken to the new reality. L.A. is in its ascendancy. LACMA, the Contemporary Art Museum, the Getty, and the Music Center have recently been joined by a host of cultural institutions, including Disney Hall, the Broad museum, the Wallis Annenberg Center for the Performing Arts, and many more. Downtown L.A. is finally evolving into a residential, tourist, and entertainment hub, as well as a business center, with restaurants, clubs, retail, sports venues, and the like. L.A.’s many institutions of higher education and medical centers rank high in the word. The newly opened Martin Luther King, Jr. Community Hospital brings needed medical services to South Central L.A. The city’s diverse economy, made up of largely small- to medium-size businesses in such fields as entertainment, tourism, manufacturing, and exports and imports continues to grow and create good jobs. L.A. is not resting on its laurels. New mega projects such as the 51-mile L.A. River revitalization, upgrades at LAX, and new Metro subway lines are in the works. Without doubt, L.A.’s aspirations have evolved. High on the list now is building more affordable housing; easing traffic concerns; restoring the high-caliber primary and secondary education that not too long ago were envied throughout the country; addressing needs of the homeless; and—at least for some—bringing back an NFL team. Linda Griego, president of Griego Enterprises, Inc., is an entrepreneur, civic leader, and former deputy mayor of Los Angeles. Metropolitan Los Angeles is world-class (whatever that means) in almost any respect, including transportation. It’s the 15th largest urban agglomeration on the planet and its economy is bigger than most nations’ economies (L.A. ranks no. 3, 6, and 9 in various global metropolitan economic indices). The city is of course a cultural powerhouse as the global center of entertainment, and its variety of ethnic food cannot be beat. And to the surprise of many, L.A. is also the most densely populated urbanized area in the U.S., denser even than New York. (The Big Apple’s center is denser than L.A.’s, but New York’s suburbs are much lower density than L.A.’s). This relatively high population density over a very large area explains why the Southland is chronically traffic congested: There are lots of people, development, and trips relative to the available road space. All those people and vehicle trips are loaded daily onto the world’s most remarkable and extensive (albeit overcrowded) metropolitan freeway system. Again to the astonishment of many, Angelenos actually drive less than the average American, and less even than the average metropolitan resident. Also flying in the face of conventional wisdom, the City of Angels hosts the second most public transit riders in the country on a vast network of buses and growing number of subway, light rail, and commuter rail lines. And Los Angeles is the North American birthplace of bus rapid transit, the most remarkable transit innovation in a half-century. But wait, there’s more: L.A. is the nation’s pioneer of “congestion pricing” on the 91 express lanes in Orange County (and later on the Harbor Freeway), which effectively increase the throughput of people in congested corridors. And while L.A. was not the birthplace of “transportation network companies” like Lyft and Uber (that honor goes to San Francisco), it was among the first cities to host their widespread deployment. Long Beach and L.A. lead the nation in the development of bike lanes in big cities. And finally, our twin ports in L.A. and Long Beach are the largest in the Americas, and linked to the American heartland by a vast network of highways, railroads, and logistics centers. As the worldwide movement of goods grows faster than the movement of people, L.A.’s role as a global center of trade is a big deal. Brian D. Taylor is professor of urban planning and director of the Institute of Transportation Studies and Lewis Center for Regional Policy Studies in the UCLA Luskin School of Public Affairs. This is part of Is L.A. Still a City of Big Dreams?, a project of Zócalo Public Square. *Photo courtesy of Steve Hymon.